Should we be looking to speed more and more UK citizens out of the UK on low cost leisure breaks when our coastal regions are crying out for tourism and income and aviation is one of the most pollutants when it comes to carbon emissions and climate change? Any new railway line is to be welcomed as it is hoped that it will remove many vehicles from our much congested road network, but the Airports Commission was set up by the Government to investigate aviation growth. It looked at a rail link between Gatwick and Heathrow which was termed ‘Heathwick’, something favoured by the now Mayor of London, Sadiq Khan. The Commission found that the airlines did not welcome it due to point to point air travel which did not call for the transfer of passengers betriveen Heathrow and Gatwick. The article by Joshua Powling needs to be viewed through tinted glasses as are we to encourage the destruction of green belt and countryside to boost the export of UK citizens overseas on low cost leisure travel that brings little into the UK pursel The amount of countryside, houses and businesses that would have to be destroyed by such a link would in our view be criminal. Sussex, Surrey and Kent are already facing their current challenges of endeavouring to find land to build affordable houses so to suggest such a line can only be an added complication for more anti-campaigns to stop such madness. Whilst we welcome the Government’s recent announcement to invest in the Croydon Windmill section of the Brighton Main Line railway, we have to hope that this will assist our coastal regions that are crying out of economic boosts through tourism. the UK purse rather than encouraging mass export of citizens and in so doing reduce the impact aviation has on climate change. 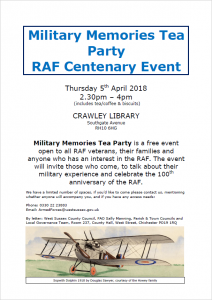 Military Memories Tea Party is a free event open to all RAF veterans, their families and anyone who has an interest in the RAF. The event will invite those who come, to talk about their military experience and celebrate the 100th anniversary of the RAF. Plans to redesign the road layout around Three Bridges would leave drivers facing a long detour if they want to go east, a taxi driver has warned. Derek Kiernan, a taxi driver and a taxi drivers’ association committee member, told the Crawley Observer that he is keen to highlight an issue which could cause huge inconvenience to drivers, particularly taxi drivers and their passengers. “One of the proposals is for no right turn from the station he said. *The proposal is that you leave Three Bridges station and go to the Paymaster General’s roundabout. 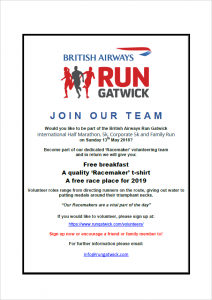 You may already know about our brand new community running event for the South East – the British Airways Run Gatwick International Half Marathon, 5K/Corporate 5K and Family Run taking place on Sunday 13th May 2018, starting and finishing in Crawley’s Southgate Park. Runners will complete either a 13.1 mile or 5km route through stunning local scenery and youngsters and their families will be encouraged to participate and enjoy a 1 mile run in and around the centre of Crawley. We are working closely with Crawley Borough Council and British Airways on delivering this new mass participation event for the area. For the last four years we have organised a very similar event in Reigate called Run Reigate which has been extremely successful and has raised so far over £700,000 for charities in Surrey and Sussex. This year we are launching our Run Gatwick event in Crawley and it’s designed to get people active, boost local tourism and support many local charities. For this event to work, we recruit around 300 volunteers (marshals/racemakers) and this is my reason for contacting you as we would the community to be involved .. We have quite a few roles to fill, ranging from marshals for the routes, team leaders, water, medal, and banana distributers and running the Information Tent.